At this time of year, we look forward to the years to come, as well as the year which has been. Stirling Golf Club members are looking forward to celebrating the 150th anniversary of the founding of their Club in 2019. Here is a story central to the success of the club. 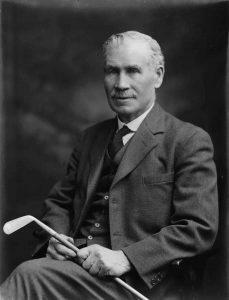 John Duncan (1861 – 1939) came to Stirling in 1901 as Stirling’s first golf professional. He was born in Fife, and served his apprenticeship as a club maker with Forrester of Earlsferry, Elie. His first job was as a professional at Peebles, then at Kelvinside Golf Club. Duncan was paid £1 per week with a free workshop, coal and gas. In 1912, this rose to £1. 5 shillings per week, in recognition of his work for the new course. He lived in St Ninians, attending St. George’s Church for almost 40 years, where he was an elder. He was the professional at Stirling Golf Club until 1935. The Stirling Smith Art Gallery and Museum has several clubs with his stamp, and this photograph by Crowe and Rodgers was loaned by his daughter- in- law Lesley Duncan, Poetry Editor of The Herald newspaper. Her own poem, The Nineteenth Hole, is dedicated to the members of the Golf Club.